Welsh v Tysoe at Powderhall. It is natural to feel that the best race we have ever seen was the best ever seen. This feeling is more common now when we have televised races and ‘pundits’ emphasising how good a race has been and the talent of a particular athlete, often a person friend or acquaintance. It is therefore appropriate that some of the great races of the past are described both as a corrective to this tendency and to give some credit where it is due. It is in this spirit that the following article from ‘The Scots Athlete’ of August 1947 is reprinted here. It affords a certain measure of relief to find a momentary relaxation in the quiet contemplation of the achievements of amateur athletes of past generations , especially in the present age when the increasing tempo of life permeates even the atmosphere of amateur athletes. It is then with this definite purpose in view that the following narrative of the great race between Hugh Welsh, the famous Scottish athlete of the 1890’s, and his equally celebrated contemporary Alfred E Tysoe, over a distance of one mile, seeks to find a place within the pages of ‘The Scots Athlete’. Probably a brief detail of both men – by way of introduction – will assist a younger generation to assess more accurately the merits of the contestants, and also appreciate more fully the intense interest which their meeting aroused among the sports-loving public of fifty years ago. Hugh Welsh was an athlete from his childhood days, being, as it were, to the manner born. Even in his preparatory school days, as a pupil of |George Watson’s Boys’ College, he was recognised by his companions as a formidable opponent in all their games, and his later achievements on the running track, indeed, at this distance of time are still recalled with pride by all Watsonians. He really began his brilliant though short athletic career as a lad of 15 years amidst the beauties of the Pentland Hills, on the occasion of Sunday-School picnic by Habbies Howe, a hamlet situated south of Edinburgh. On this occasion, the suggestion of a teacher, that a foot-race to the top ofa nearby hill (Carnethy) and back be organised for the older scholars, was immediately agreed upon. Among the starters was Hugh Welsh, and his arrival at the winning post several minutes before his nearest rival was the first visible evidence to his friends of the wonderful gift of stamina and speed which Nature had bestowed upon him. Whilst yet in his early teens, Welsh was soon competing against more experienced opponents, and by his successes gaining high praise from the athletic pundits of the time. His many honours upon the track included SAAA, IAAA and AAA titles, International selections, and triumphs in the less exalted sphere of handicap events, adding his name, incidentally, to that dubious category of athletic distinction as a record holder. It was as a lad of 16 years that he took part in the SAAA One Mile Championship of 1894. This was an event that has no parallel in the history of Scottish athletics. There were only two competitors, and it recorded the slowest time of all one mile championship races, either before or since (5 min 36 sec). Yet in contrast it produced the fastest last quarter-mile time that has ever been clocked in this event. J Rodgers, of Maybole, Welsh’s solitary opponent, took the youth at a crawl for three-quarters of a mile, and at the bell burst away at a tremendous gait from his youthful opponent. It is a matter of recorded history, verified by the late DS Duncan, then Hon Secretary of the SAAA and one of the official timekeepers on that occasion, that the time for the last quarter-mile was 54 sec, and the verdict – an inches decision for Rodgers. It was in the AAA’s Championships of 1897, whilst competing in the One Mile race at Fallowfield, Manchester, that the incident of the spiking of Welsh occurred, which resulted in his defeat. Tysoe won the title; but be it laid to his credit, that so dissatisfied was he with the honour he had gained against a disabled opponent, that he indicated his willingness to contest the distance again at a time and place which would be mutually suitable. 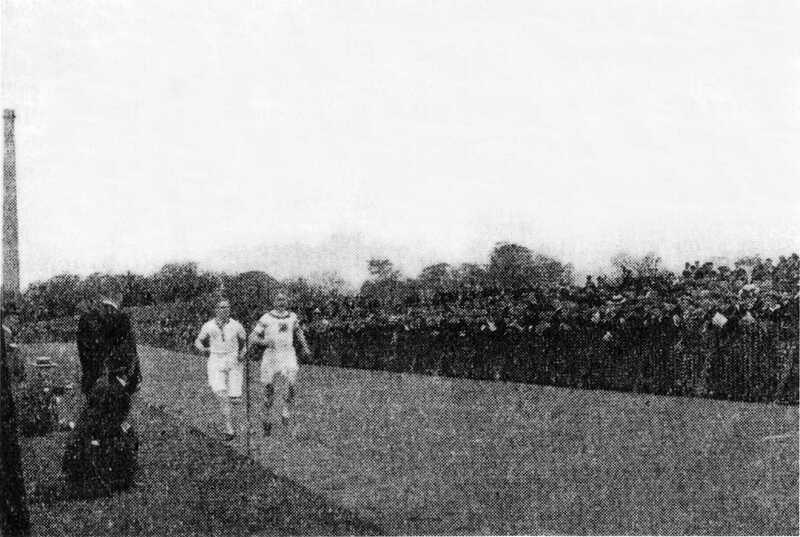 Later a match was arranged, and, accordingly, on May 29th, 1898, on the occasion of the Watsonian Athletic Club sports at Powderhall, this memorable one mile race was decided, for which a handsome trophy, weighing 74 ounces and a beautiful specimen of the silversmith’s art, was subscribed for by members of the promoting club. In his Lancastrian rival – Alfred E Tysoe – Welsh was tackling a worthy opponent – one, moreover, who had had a much wider experience of competitive foot-racing. Tysoe had graduated quickly from handicap ranks to a national eminence in athletics. He was a runner of extraordinary versatility, winning races from 220 yards up to 10miles. His AAA titles included the 880 yards (1899, 1900), 1 Mile (1897), and 10 Miles (1897); and he was also one of the winning six which carried the Salford Harriers colours to victory in the National CC Championships of 1898. It is related of Tysoe that his appearance in the 10 Miles Flat Championships was merely in the nature of a training run and simply to be regarded as a prelude to his efforts for the season just beginning. Clad in sweater and a scarf he jogged along for over 5 miles, and only in the latter stages of the race did he become conscious that he had distinct prospects of success. Doffing his top-sheets en route Tysoe set about confirming his belief, and thanks to the slowish pace of the race throughout, he was able to utilise his turn of speed to run home a comfortable winner. A frequent visitor to Scotland – and an exceedingly popular one – Tysoe ran some splendid races at Powderhall, on one occasion establishing a Scottish all-comers record for the 880 yards, when winning a handicap event over that distance at the annual sports of the St Bernards FC at Powderhall Grounds in 1 min 57 4/5th sec from scratch. So much then concerning the principals in this athletic drama. The following description of the race is from the pen of the late David S Duncan and here acknowledgement is now gratefully made for permisson to print the extract and accompanying illustrations, from the pages of the school publication “The Watsonian” to I Graham Andrew, Esq, Headmaster of George Watson’s Boys’ College. Welsh was the first to emerge from the stripping-box, and received a tremendous ovation from the assembled thousands, and when Tysoe appeared a few seconds later, his reception was none the less enthusiastic. Both men looked the picture of health and fitness. Welsh, who is 5’8″, weighs 10 st 2lb, whilst Tysoe stands 5’7″, scaling at 10st 7lb. There was a low buzz of excitement as the men toed their mark at the north-west corner of the grounds, the race being run left-hand in at Tysoe’s request. The Englishman drew the inside position but when Mr John Davidson, the well-known Powderhall handicapper, sent the men on their journey Welsh was the first to forge in front, with Tysoe at his elbow both running free and easy within themselves. A brisk pace was maintained and when the first lap had been covered, the enemy recorded 62 2/5th sec. The second lap was a repetition of the first, except that Tysoe had fallen behind Welsh and given himself more elbow-room; the time returned for this quarter was given as 68 sec. Excitement was gradually rising as the runners entered into the third lap, and every stride seemed to be followed with eager intensity. Tysoe seemed to be running well within himself, and there seemed to arise an uneasy suspicion that the Scot had at last found his master. At the end of the third lap, covered in 71 1/5th sec, Tysoe bounded into the lead, and entered the ‘stand’ straight with a clear margin. As he passed down that straight he was encouraged with a loud cheer from his Prestonian friends, who were present in large numbers to support their man, not only vocally but financially. He sustained his burst of speed and entered the home straight with a 10 yards lead, and it seemed, for the moment, that Welsh was outclassed. Here it was, however, that Welsh made that wonderful effort which can never be forgotten by those who witnessed it. He came away at sprinting speed – and remember, Tysoe was running at top speed – caught Tysoe some 50 yards from the tape and simply left the Englishman standing. Both athletes have passed from the scenes of their athletic triumphs, but they have left behind them a stirring memory to those who witnessed their gallant efforts, and – let us hope – an inspiration to succeeding generations of youth.